Big Beam Team, from left, Anmol Pakhale, Nate Scharenbrock, Michael Rosenthal, and PCI producer Jeff Butler (lower right). A team of three Iowa State University graduate students earned a top 10 finish in a national competition for the best “big beam,” and their video documenting their project earned a top award. 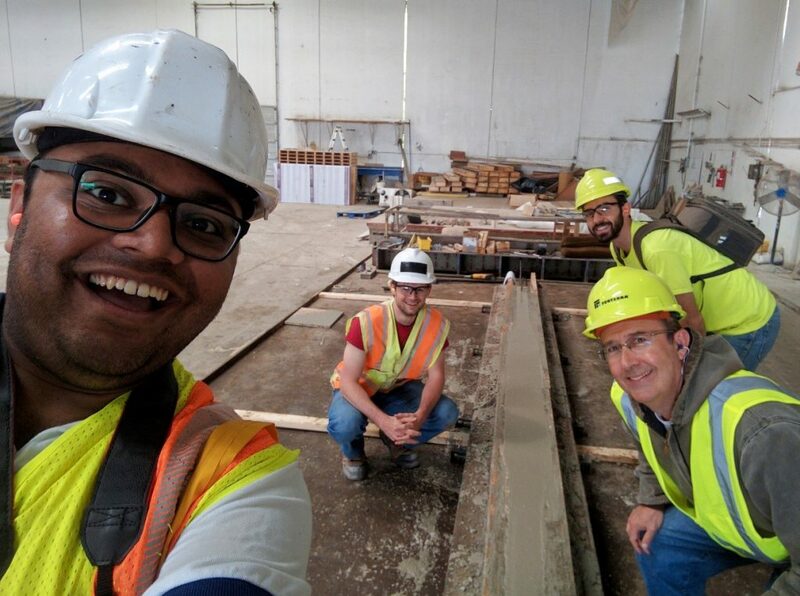 Anmol Pakhale, Michael Rosenthal and Nate Scharenbrock tied for ninth in the PCI (Precast/Prestressed Concrete Institute) 2016 Big Beam Contest. Students had to design, fabricate, analyze, and test a prestressed concrete beam judged on several criteria including efficient design, load capacity, and lowest cost and weight. The three are graduate students in the Department of Civil, Construction, and Environmental Engineering (CCEE). Pakhale also is a researcher at ISU’s Institute for Transportation (InTrans). Their custom-made, steel-reinforced prestress beam was 15 feet long and weighed 970 pounds, and was manufactured at the Forterra Pipe and Precast plant in Iowa Falls, Iowa. Testing took place at an ISU structures lab. “We had to design a beam that met all of the contest’s requirements, and we had to make it as low in cost and weight as possible,” Pakhale says. The ISU team finished ninth out of about 30 teams, earning it a $1,000 prize, and was second in the Midwest zone. As part of its contest entry, the team also created a video, The Story of CyBeam, showing how the beam was designed, constructed, and tested. Pakhale explained the team wanted to have some fun with the video. The result was a parody of the popular ESPN “Game Day” program that airs during college football and basketball seasons. The video was judged the winner of 29 entries, earning the team an additional $500 prize. The team’s faculty adviser was Sri Sritharan, the Wilson Endowed Engineering Professor in CCEE.